Customer Creations – Making a unique and appealing graphic in a program like Photoshop allows you to combine text with an image and will stand out because people haven’t seen it before. It is important not to use just any image that you come across on the internet. Copyright is automatically assigned upon the creation of the original work whether a copyright has been filed or not. Any violation or misuse such as duplication, use to gain monetary value, or claiming it as your own is considered copyright infringement. As mentioned earlier the subject of copyright infringement can be avoided all together if you use your own original photography or create custom graphics that don’t incorporate someone’s image. According to the U.S. Copyright office “Acknowledging the source of the copyrighted material does not substitute for obtaining permission”. Meaning that simply lifting an image from another blog and providing them credit for the image is not a good practice. So where can you find photos? There are a couple different options, one of which is to pay for your images via websites like iStockPhoto, BigStockPhoto, and DreamsTime. The other option is to use photos licensed under Creative Commons. 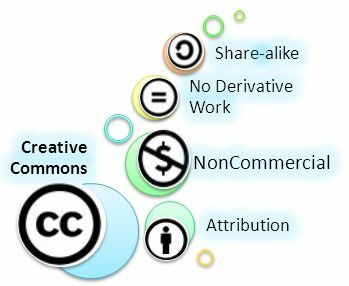 Creative Commons is an organization that is devoted to expanding the range of creative works available for others to build upon legally and to share. These types of licensed photos can be found at website like Flickr, Fotopedia, or directly searched for on the Creative Commons website. Creative Commons allows the image to maintain its copyright but also allows people to copy and distribute work given that they provide the original owner with the credit. There are several different copyright licenses available through Creative Commons. The four original licenses provide only the basic rights however there are also combination licenses that expand on the rights and restrictions that are assigned to the original work. Attribution (by) Licensees may copy, distribute, display and perform the work and make derivative works based on it only if they give the author or licensor the credits in the manner specified. Share-alike (sa) Licensees may distribute derivative works only under a license identical to the license that governs the original work. Allows you to distribute, alter, and build upon the original image for personal or commercial purposes, provided that you credit the creator. Allows you to alter or expand upon the image for non-commercial purposes, provided that you credit the creator. The new art that you create will not carry the same license as the original image, but still must be used for non-commercial purposes only. Allows you to distribute the image “as is” for commercial and non-commercial purposes, provided that you credit the creator. Allows you to alter and build upon the original image for commercial and non-commercial purposes, provided that you credit the creator. Any of the new art that you create based on the original image will carry the same license and be available for commercial use by others. Allows you to share the image, as is, and for non-commercial purposes only provided that you credit the author. This is the most limited license. Allows you to alter and build upon the original photo for non-commercial reasons only, provided that you credit the creator. Any alterations carry the license of the original work. Now that you know the how images help your blog, where to find them, as well as the terminology to watch out for you should be able to easily find images for your blog and increase the engagement level of your readers. This entry was posted on Friday, October 28th, 2011 at 11:13 am	and is filed under Blog Hints. You can follow any responses to this entry through the RSS 2.0 feed. You can leave a response, or trackback from your own site.